Potato dishes are often regarded as comfort food. Some prefer them fried; others like it mashed. One other way of cooking this popular starchy crop is through baking. Apart from the ordinary baked potatoes, two other popular baked potato dishes are scalloped potatoes and au gratin potatoes. Nowadays, these two dishes are often regarded as one and the same, but the original recipes actually set them apart. Read this article to find out the differences between scalloped and au gratin potatoes. 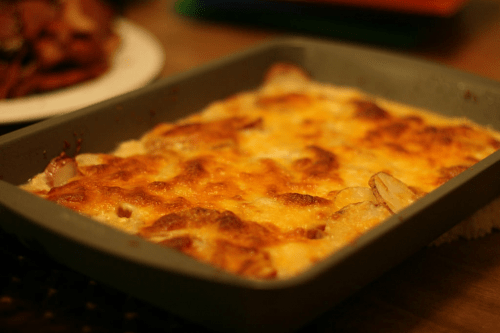 Scalloped potatoes is a baked potato dish that is made with heavy cream. The potatoes used for this dish are cut in thin slices and laid out flat on the baking pan along with a creamy base. Scalloped potatoes are best paired with salads, beef dishes, or steak. Au gratin potatoes is a type of baked potato dish. Au gratin is a French phrase meaning “sprinkled or topped with grated cheese or bread crumbs.” So essentially, this particular dish is made up of sliced potatoes and cheese and is served with a browned or crusted top. The main difference between scalloped potatoes and au gratin potatoes lies in the added ingredients. Both are potato dishes wherein the tuber is cut in thin rounds and laid flat – in layers – on a baking pan. 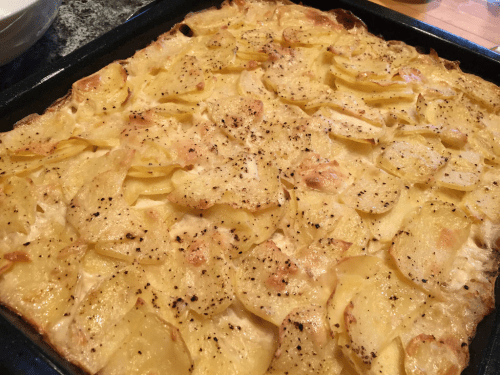 However, scalloped potatoes are baked with a heavy cream sauce together with other spices. The original recipe of this dish does not contain cheese. Au gratin potatoes, on the other hand, has always been prepared with cheese, most often with gruyere. Moreover, the au gratin dish usually has a browned breadcrumb topping. Another minor difference, based on how some people prepare their potatoes, is pertaining to the thickness of the cut. Some say that the slices used in scalloped potatoes are generally cut slightly thicker than to the ones used for au gratin potatoes. Nonetheless, both dishes are best paired with meats and salads.